MITZPE RAMON, ISRAEL–Since the water level in the Dead Sea is dropping an astounding one meter per year, the drainage base level is dropping along with it. This means that gullies and canyons feeding into the Dead Sea are eroding deeply into their channels. 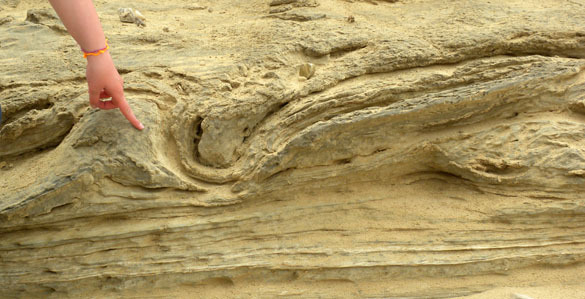 Where the soft Dead Sea sediments are exposed, this erosion is stupendous. Would you believe that the canyon above was cut in less than three years? Today we explored these new canyons near the site of the pumping station (see previous post). Here we are looking primarily at the sediments themselves. Later we will examine the patterns of erosion and subsidence. 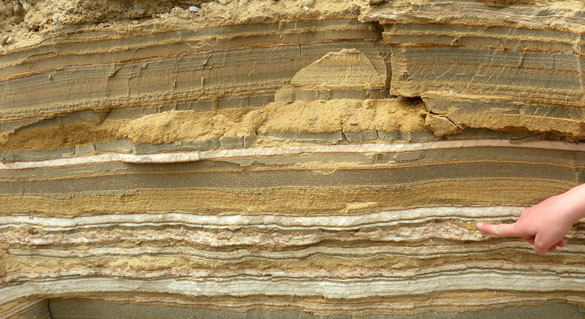 These are ripples of sand, silt and clay in a cross-section of Dead Sea sediments a few hundred years old. They started, at least, as wave ripples on the floor of the Dead Sea. Some have been modified by later storm currents. There is also an element of loading and compaction here. I suspect another factor in their morphology is the dissolution of any salt that was deposited with them. Another seismite showing well the upward injection of soft clays into overlying silts. This is my favorite seismite. I can’t explain what happened here, but a whole lotta shaking was going on. It is only near the top of the sequence, in the most recent beds, that we see salt deposits. The older salts were dissolved away by fresh groundwater coming from the alluvial fans. This is always a lesson in sedimentary geology — think of what you don’t see. The previous salt beds were erased from the record as the other sediments collapsed down into their places. The rapid decline of the Dead Sea is an environmental disaster with many ramifications. Nevertheless, the resulting massive erosion of the Dead Sea sediments has given us much information about the past, and data with which we can predict the future. Strange how disaster, in this case environmental, can be good for scholars. It creates opportunities to see things you would never otherwise see. I felt the same way observing the fall of the USSR. As Soviet society fell apart, you could see things that weren’t previously visible and aren’t necessarily visible in more stable communities. Does this create an ethical dilemma for scholars? Wow! 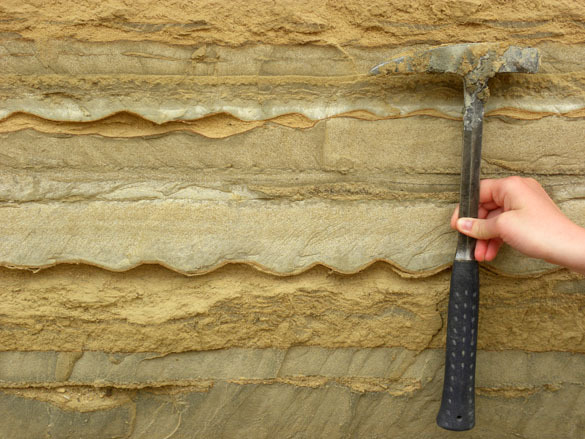 Impressive (and beautiful) sedimentary structures. Fabulous photos! I’d love to see in person someday. I’m going to put my nit-picky professor hat on just for a moment. The term ‘seismite’ is very interpretive. 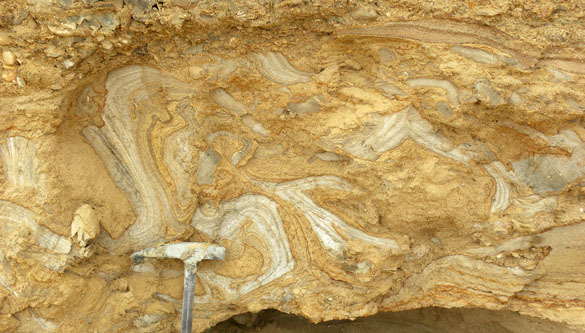 This type of soft-sediment deformation can occur in a variety of depositional environments in the absence of an external trigger such an earthquake. All that’s needed is rapid deposition and a density contrast. I realize that, in this case, there is good chronology and paleoseismic records to correlate to, so the interpretation is likely strong (and very cool!). But, one could end up making some erroneous leaps of inference if they went somewhere else, documented soft-sediment deformation, and automatically conclude it must’ve been triggered by a seismic event. Thanks, Brian, and very good point. We do seem to be lucky in this case that there are such long historical records that correlations could be made between known earthquakes and the dated deformations. Without them it becomes much more problematic. These are some pretty spectacular photos. It is hard to believe that those canyons are so young! I have to make time to go take a look. I am so enjoying this blog! Wish I could take you on one of our hikes so you could explain the geology to us. Some of the formations we see are hard to understand to say the least. Maybe on your next trip. Bookman, R., Enzel, Y., Agnon, A., and Stein, M., 2004, Late Holocene lake levels of the Dead Sea: Bull. Geol. Soc. Am., v. 116, p. 555-571. Filin, S., Avni, Y., Baruch, A., Morik, S., Arav, R., and Marco, S., 2014, Characterization of land degradation along the receding Dead Sea coastal zone using airborne laser scanning: Geomorphology, v. 206, no. 0, p. 403-420. Ken-Tor, R., Agnon, A., Enzel, Y., Marco, S., Negendank, J. F. W., and Stein, M., 2001, High-resolution geological record of historic earthquakes in the Dead Sea basin: J. Geophys. Res., v. 106, no. B2, p. 2221-2234. Ken-Tor, R., Stein, M., Enzel, Y., Agnon, A., Marco, S., and Negendank, J. F. W., 2001, Precision of calibrated radiocarbon ages of historic earthquakes in the Dead Sea Basin: Radiocarbon, v. 43, no. 3, p. 1371-1382. Kagan, E. J., Stein, M., Agnon, A., and Neumann, F., 2011, Intrabasin paleoearthquake and quiescence correlation of the late Holocene Dead Sea: J. Geophys. Res., v. 116, no. B4, p. B04311. Marco, S., Stein, M., Agnon, A., and Ron, H., 1996, Long-term earthquake clustering: A 50,000-year paleoseismic record in the Dead Sea Graben: Journal of Geophysical Research, v. 101, no. B3, p. 6179-6192. Alsop, G. I., and Marco, S., 2011, Soft-sediment deformation within seismogenic slumps of the Dead Sea Basin: Journal of Structural Geology, v. 33, no. 4, p. 433-457. Thank you, Elisa. I’d love to see those features again on my next visit to Israel! Thanks for the references. This subject greatly interests me, although I have no geological background. The pictures are beautiful, but scary. My question to you is, What can be done about it? I understand that the water being diverted from the Jordan river is for drinking supplies. If this was not done, then more water would have to be taken from the Mediterranean for desalination, and that would be adding to another environmental disaster to the sea life in the region. Is there a solution? Anyone? it is very intersting i like to say again. that had rain over the area. it afflicts all the area arround the dead sea in that time. here is a link you mast watch. Thank you Maurice for that information and video link. That is precisely what happened a catastrophic downpour of fire and brimstone (sulfur) from the heavens. God destroyed those cities and the evidence remains. Of course there will be those who consider the evidence, naturally occurring but we know that the Bible clearly gives the details.